Al Capone's personally owned Art Deco Silver photo locket - Circa 1930-31. 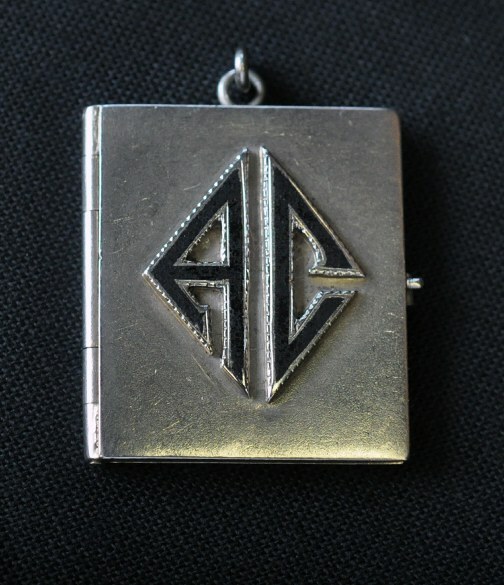 Silver locket with art deco style "A C" black enameled initials was owned and worn by Al Capone. 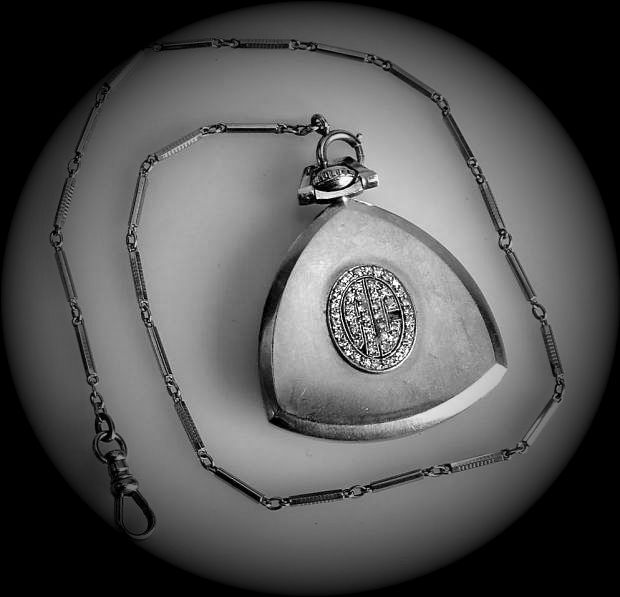 This locket was attached to a Capone pocket watch like the authentic one found HERE. Please note that this pocket watch is not in my collection and is only used in reference to my Al Capone locket. 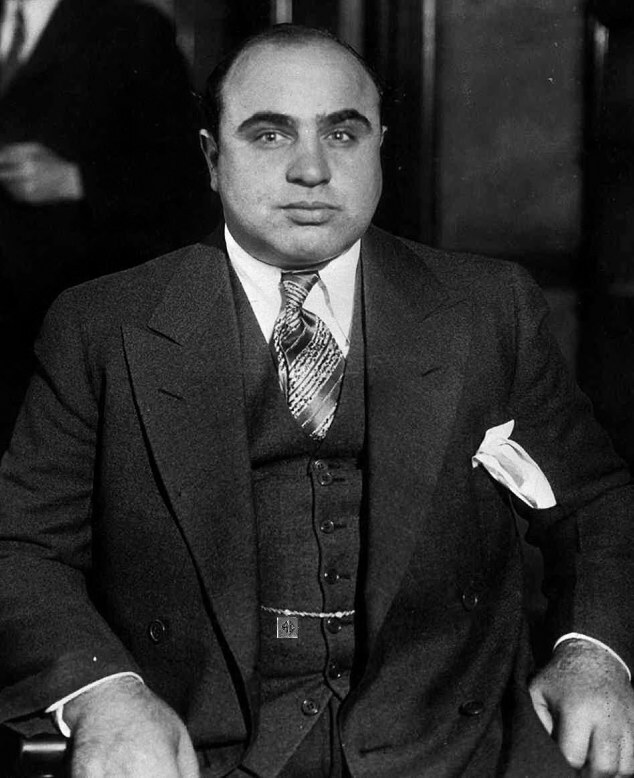 1) Al Capone's personally owned items were only monogrammed A.C. , not AL, not A, not C, or any other letters!! That's why it's very important to have solid provenance when acquiring these items. A good source are Items that were passed down by actual Capone family members or relatives or people that were close to the Capone family. Do your homework and if you get the chance to buy at an auction or estate sale where family members or friends are selling family items, then save your money and go for it! These are rare and hard to come by. It's better to bite the bullet and pay more money for something real than it is to pay little for something that is fake. Something real will always retain it's value, if not more. 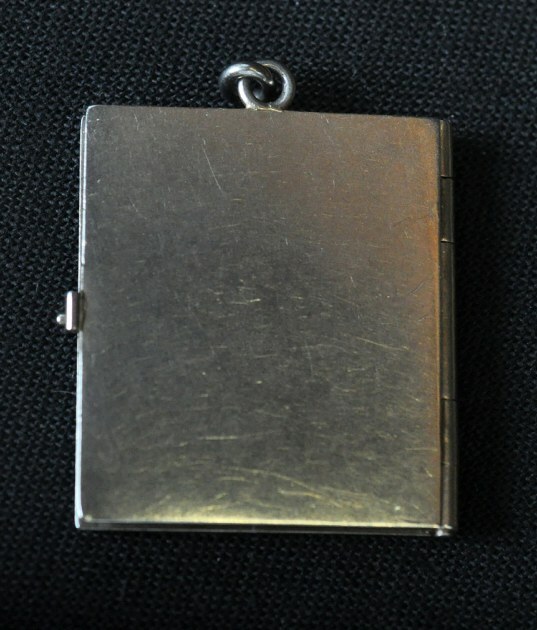 From the Capone family estate sale here is Al Capone's personal silver pocket watch fob photo locket. 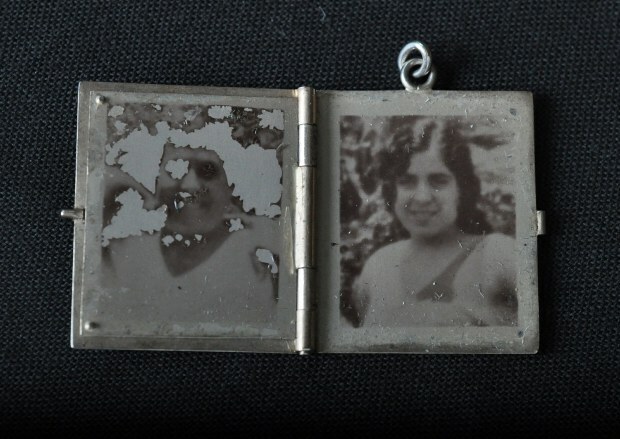 This locket contained photos of the most important in Al Capone's life. His beloved wife Mae, the apple of his eye Sonny, his dear mother Theresa and his staunch defender and only little sister Mafalda. (Al's only other sister had been dead at birth). While Al loved all his family, he kept these four real close to his heart at all times. Due to the personal nature of this locket, it was almost certainly given to Al by Mae. The sequence of photos shows this. Mae first, Sonny then Theresa and Mafalda. Mae wasn't mean and would not exclude Al's family. Mafalda on the other hand would never put Mae first, if at all! Mae Josephine Coughlin Capone and Albert Francis "Sonny" Capone. Notice the burn mark and the X scratched on Mae's picture. This was done after Al's death when the locket was in Ralph Capone's possession. This may have been done by either Mafalda or Theresa, both of whom were jealous and resented Mae. I'm more leaning towards Mafalda. This latter info was corroborated by a Capone family member close to Mafalda. 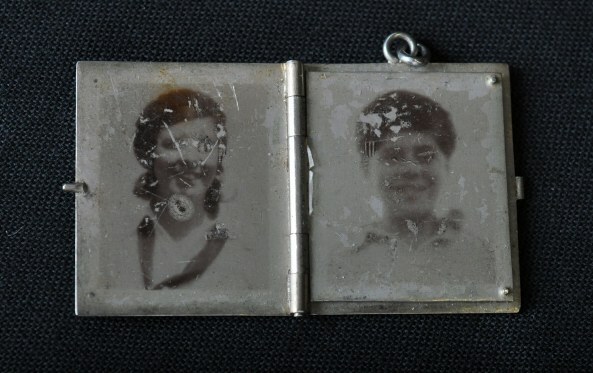 In his moments of loneliness and melancholy or during his trips away from home Al would probably have thumbed through the locket as shown by the wear on the photos. Al would have definitely shown the photos when talking about his family to friends and business associates. He was especially proud of Sonny often referring to him as "the Sheik" or "Junior". Al always referred to Mae as his "Maggie dear" or "my sweet". A reflection of Al Capone's style and taste. Even to the smallest details. Al had his initials monogrammed on everything, from his silverware to his handkerchief. This strong provenance item came with a signed affadavit from the Capone family. This locket was probably purchased at Al's favorite choice for jewelry and gifts. 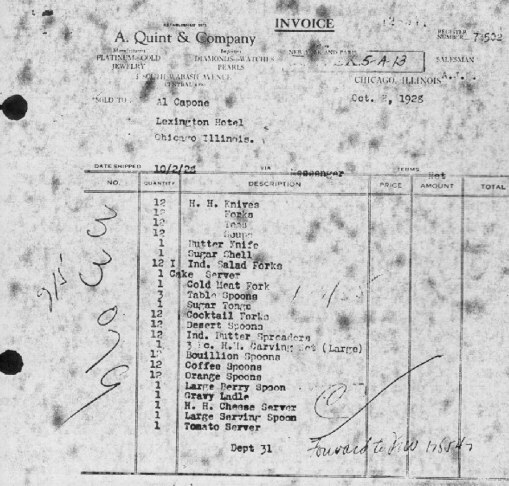 He always shopped at A. Quint Company, 5 South Wabash, Chicago. There he purchased silverware, flatware, jewelry such as rings, buckles. He also had everything monogrammed at this store. The store is no longer there but the building still stands and is still jewelry oriented. 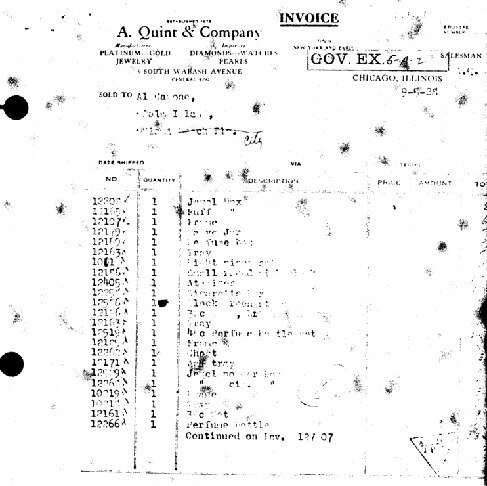 Invoices for Jewelry and other silverware purchased personally by Al Capone at A. Quint Company. The fob also helped ease the retrieval of the pocket watch from the pocket. Instead of grabbing it by the chain the user usually got a hold of the fob first. 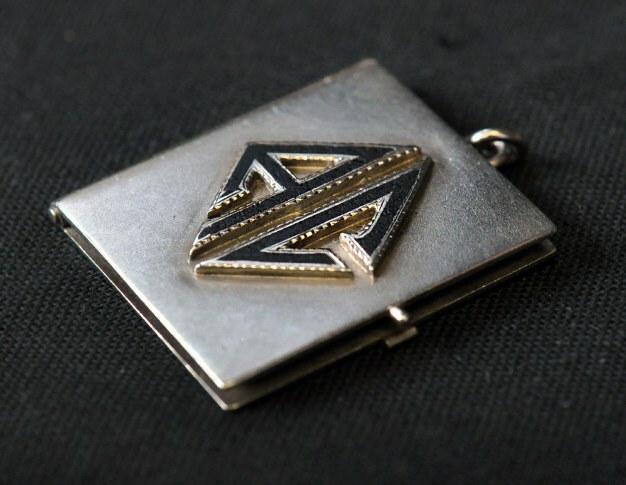 It would hang from the chain, but would be tucked away in the vest pocket. (Not evident as shown here in this simulation). Al's mom Theresa and sister Mafalda. Sadly, time has erroded some of the photos transferred to the locket. Probably due to Al's saliva. Al's mom has the most damage and may be due to the fact that Al probably kissed this photo the most. See the shape of damage. It matches the form of puckering lips. Like most, Al loved his mom. In Wisconsin hunting mid 1940's. 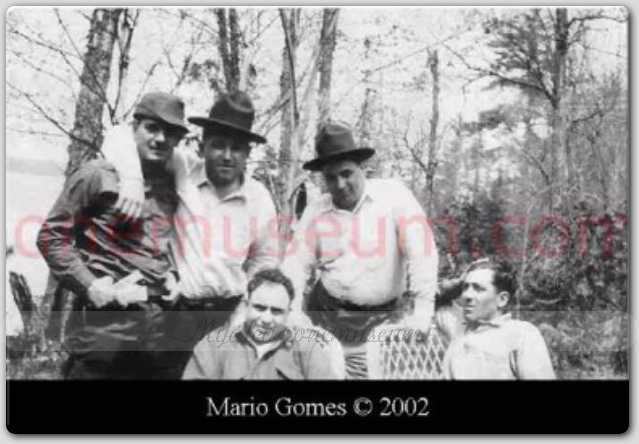 Al Capone (center) sitting and his brother Ralph J. Capone watching over him (right standing). 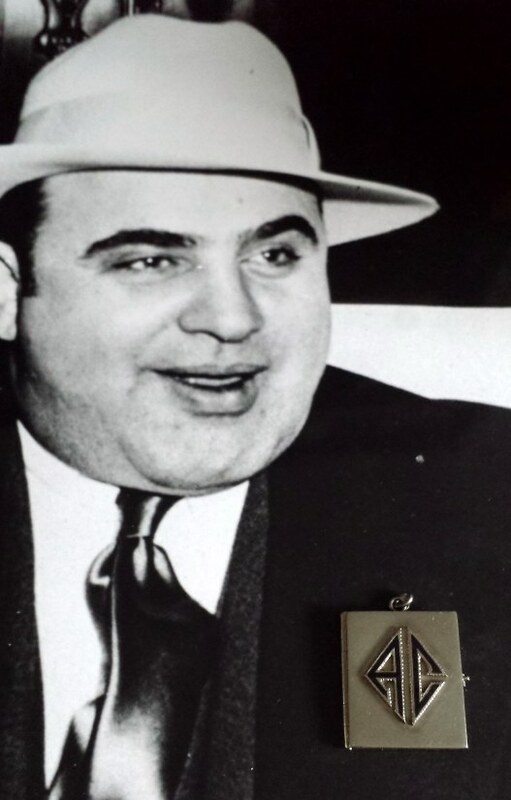 This amazing piece of Al Capone memorabilia was obtained through the ATR estate sale company. The item is from the Capone family estate which was found in Ralph J. Capone personal keepsakes of his brother Al. Ralph Capone, who most in history have simply overlooked his role in the Chicago outfit have mistakenly not given him the credit he deserves in the history books. Ralph was a busy businessman during and after Al's reign in Chicago. It was Ralph who first joined Al in Chicago and was Al's real right hand man. He knew of Al's whereabouts at all times and helped kept business running like a top, all the while keeping Al informed when he was away. Ralph later was the glue that kept the Capone family together during times of crisis. Ralph and the Capone side of the family were not too kind to Mae and Sonny. Ralph did take care of Mae and Sonny but only as a promise to Al when he passed away in 1947. Make no mistake as Ralph was every bit tough and his word commanded respect even in his old age at Mercer, Wisconsin. Oddly in later years he had a very compassionate side, which he showed in his donations and support of local charities. Back of silver locket watch fob. My special thanks to Mr. Josh Beam and the good people at ATR Estate Sales in Wisconsin for making this item possible.